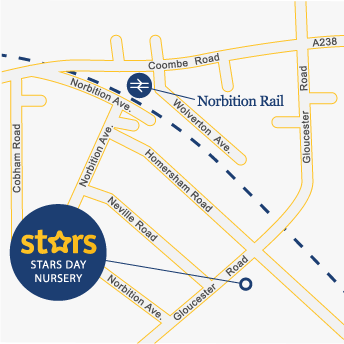 Our Kingston Nursery is set in a detached Victorian house in a quiet area of Kingston-Upon-Thames, on the same road as Kingston Hospital. 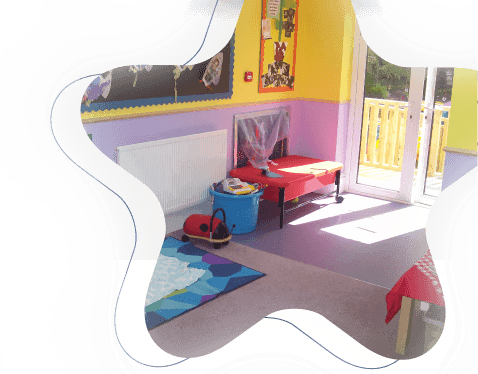 We have recently had a full refurbishment of the nursery to make it the perfect environment for your child’s learning and development. Kingston-Upon-Thames is an upmarket, popular area for people who live and work in the city as it has excellent transport links to Central London. In fact, the train station is less than a 5-minute walk from the nursery. Inside, we have the Little Stars room for babies and the Rising Stars room for toddlers on the ground floor. Our Pre-School Academy for pre-school children is based on the top floor of the building. At our Kingston Nursery, we have a spacious garden with AstroTurf perfect for all ages. In the garden, we have a ‘snack shack’ to encourage role play as well as make tasty treats for snack, we have a separate area for the children to ride bikes, a climbing frame and a pond with plenty of fish which the children enjoy feeding and learning to care for. We like to let the children play out in the garden twice a day – weather permitting! – so they can get all the benefits of outdoor play. We are situated five minutes’ walk from Norbiton mainline train station (20 minutes to London Waterloo) and 15 minutes’ from Kingston town centre. From the moment you enter one of our nurseries, you will experience a commitment to excellence that is second to none. But don’t take our word for it – come and experience the difference for yourself. The Stars Childcare Group Ltd. Copyright © Stars Childcare Group 2019. All Rights Reserved.